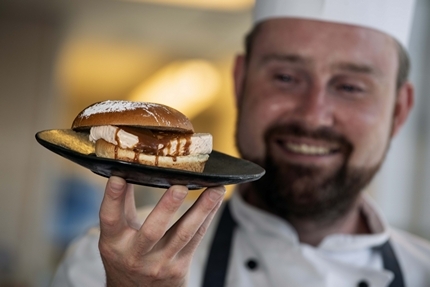 Love it or loathe it, yummy or gawds, Apex Hotels in Edinburgh at their Grassmarket Hotel have now served up the much-loved Scottish Lorne Sausage as a Square Sausage Ice Cream treat. It has been created in conjunction with the dairy firm Glen Urr to celebrate national ice cream day on 15th July. There is much debate around Scotland as to whether the Lorne sausage should be served with brown or red sauce. The creators of the Square Sausage Ice Cream have added a drizzle of toffee sauce to replicate brown sauce. 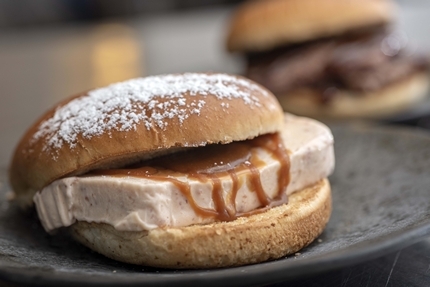 This unique dish was then served in a fresh brioche bun to add to the sweet taste. The chefs toasted the bun and gave it a dusting of icing sugar. I have to say I've never worked with such an unusual ice cream. We decided to serve it on a brioche bun as the bread is slightly sweet, and this will be toasted and dusted with icing sugar. We have also whipped up a toffee drizzle that's similar in colour to brown sauce, so it really is a sweet equivalent of a classic roll and square sausage. There's no mistaking the distinctive taste of Lorne sausage so this is definitely one for the adventurous. If you want to try something distinctly different on National Ice Cream Day drop by Apex Grassmarket! When I was asked to make square sausage ice cream, I thought wow, here's a challenge - and I love a challenge! One of the things we pride ourselves in is working under the motto "if you can eat it, we can make it into an ice cream". We've had a shot in the past at making all kinds of flavours, from haggis ice cream to vodka sorbets, and the savoury flavours are definitely the bigger challenge. Jane follows a traditional approach to ice cream making, with the key ingredients being milk and cream from her family business's herd of 200 Ayrshire cows. The star ingredient of Lorne sausage was sourced from Grierson Brothers Butchers in Castle Douglas before being cooked up, grated and added to the mix. Read about the origins of the Lorne Square Sausage.